While there's been no shortage of Kanye West news recently, a rather unexpected story has emerged from the sidelines. Over the weekend, Kanye was photographed wearing a T-shirt from none other than metal unit Testament — something that's spurred not one but two lengthy responses from the band. After seeing a series of recent photos showing Kanye in a Testament T-shirt from UK tabloid the Daily Mail, the band's guitarist Alex Skolnick apparently felt compelled to comment on the whole thing, and soon his views on the "trendy fashion" statement emerged online, and he wasn't too pleased by it all. You can see one of the photos of Kanye wearing the shirt below and more here at the Daily Mail. However, Skolnick wasn't content to just leave it at that and went on to post yet another think piece about Kanye wearing the T-shirt. Yeah, we also didn't know that rappers wearing metal tees was such a big deal, but you can read though the length reaction post from Skolnick below. I like hip-hop generally and while not a Kanye West fan, I recognize that Kanye is respected by some folks in the music industry whom I respect. Normally I'd be flattered and appreciative from one artist to another (those who follow me outside Testament know I'm very open musically and work with artists of many genres). 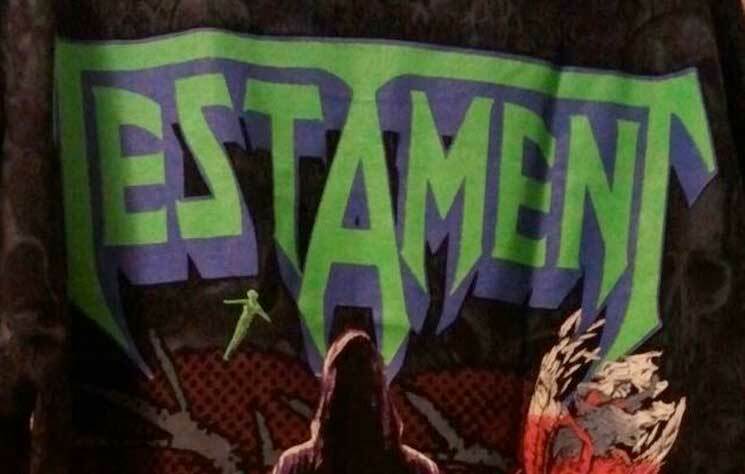 If Kanye genuinely knows and likes Testament — and isn't just wearing our shirt as part of this current bizarre fad among trendy fashionistas and Hollywood types to wear old metal concert tees — then that's great, more power to him and respect. However, I truly doubt that's the case (and would love to be proven wrong). It's not the music/artist part of the equation I have a problem with — it is the reality TV, publicity junkie part. Kanye may consider himself an artist, which I can accept (although an artist on the level of those he compares himself to? Pablo Picasso? Sorry, not feeling it). Artistry aside, the Kardashian clan (of which he's a part of by marriage) are not doing art — it is the lowest form of cheap entertainment, turning people into brainless nincompoops and slowly destroying the country, a place that's descended to the point of the majority now embracing anti-intellectualism, denying facts, disbelieving science, believing fake news, avoiding rationality, shunning critical thinking and no longer recognizing the difference between reality and reality TV (case in point: electing a reality TV star as president, someone Kanye is now cozying up to). I find these offenses so unforgivable that I cannot find enjoyment in a major celebrity and artist I'd otherwise respect (musically, at least) wearing our shirt, much as I'd like to. So my initial response, while admittedly less eloquent, it is still an honest reflection of the moment.